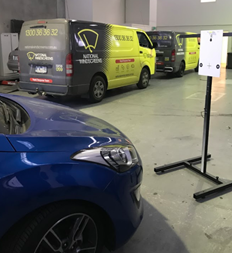 National Windscreens has invested in ADAS camera calibration technology, allowing us to provide windscreen replacement and windscreen calibration when required. If your vehicle boasts ADAS safety features, it’s crucial for calibration to be performed when your windscreen is replaced. ADAS includes a wide range of safety features for vehicles, such as autonomous emergency braking (AEB), lane departure warning (LDW), lane assist, night vision cameras and adaptive lighting. By 2020, it is predicted that more than 40% of new vehicles will have at least two types of driver assistance systems fitted as standard, so the need for ADAS camera calibration will continue to grow. Most ADAS features rely on windscreen-mounted cameras in order to operate effectively. So if a windscreen needs replacing, these cameras may have to be calibrated to ensure the safety systems continue to work as intended. At National Windscreens, we can provide windscreen calibration to ensure your vehicle’s ADAS features continue to work safely and accurately. If you’re searching online for how to calibrate lane departure, don’t risk doing it yourself – enquire with National Windscreens about our safe and reliable windscreen calibration services. Contact us today for more information on ADAS Calibration by emailing info@nationalwindscreens.com.au or calling 1300 36 36 32.